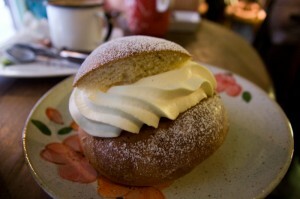 Today is Semla Day in Sweden. I don’t think that is its actual name but it is the day that Swedes munch on delicious semlas in the same spirit that people scoff pancakes in England. It was originally intended to be eaten only on Shrove Tuesday but now in the lead up to the beginning of Lent you find them all over Gothenburg, spilling out of cafes and bakeries. I really hope you can also find them after today because they are truly yummy. They are basically a wheat based bun filled with almond cream and fresh whipped cream. Here’s a recipe for those of you not in Sweden. I met up with Ines, Lena and Emi in Café Kringlan in Haga to enjoy a feast of tea and semla and here in a pictures of the actual one I ate – before I ate it. This entry was posted Tuesday, February 24th, 2009 at 11:24 pm	and is filed under Cafés. You can leave a response, or trackback from your own site.